This configuration is illustrated in Figure 1. This configuration is similar to the configuration recommended by the European Union. It is a decentralised system where a separate frequency is placed on each berth. These are radially feed from a common substation. The transformer at berth serves an additional function in this configuration. It serves together with the frequency converter as a curve shaper, to form the sinusoidal curve shape. To adapt the feeding voltage to the frequency converter additional transformer is required. There are few frequency converters obtainable and which are suitable for this purpose, which require a voltage between 1-5 kV. This voltage in the feeding network and in the substation will result in very high currents at power ranges in this context. A step-down transformer is therefore necessary to be able to allow higher voltages in the feeding network, and in that way reduce the current and thereby reduce the cable losses. 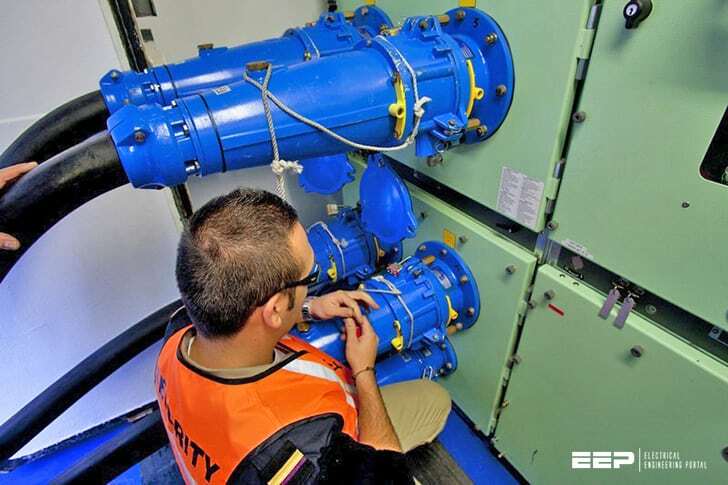 The dimensioning of the frequency converter has to be done by means of the highest power demand at the present berth, and has to have the same rated power output as transformers at berth, this to avoid being a bottleneck in the total system. This configuration has a free-standing system at each berth which can be seen as an advantage if a fault occurs at the facility. If a fault takes place in one of the frequency converters then this berth can be disconnected without any influence on the other berths. Even regular service work is facilitated when having a separate system according to this configuration. A disadvantage of this configuration is that it takes a big amount of space at each berth, something which can be very critical for example in a container terminal, where both cranes and industrial trucks net accessibility, and where space for piling up containers already is limited. The space needed for the frequency converter, two transformers and switchgears with earth switch equipment and a disconnector is approximately 190 m2. An additional disadvantage with this configuration is that the frequency converter is used for both frequencies. When a vessel with a 50 Hz electric system is connected, the frequency converter is feeding the vessel with 50 Hz, which can be considered as excessive, since the network grid is alerady feeding the system with 50 Hz. This is not a big problem, considering that today’s frequency converters have a high efficiency, 98-99 % but it is although noticeable at high power ranges and should be considered as a disadvantage.